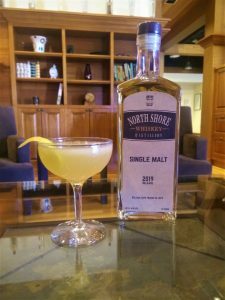 We’ve had a special cocktail menu with our single-malt whiskey for its release before, but now we’re adding a single-malt whiskey cocktail to our regular menu! This cocktail is new to us, but it’s a classic from the Savoy Cocktail Book – it may sound unusual, but it’s delicious. Shake ingredients with ice, then strain into a chilled coupe glass and garnish with a lemon swath.